On March 24, 2005 it was six years since NATO bombs to create peace began to fall. What peace is there today? What will there be tomorrow? 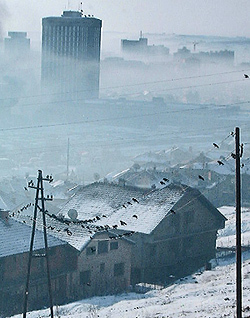 10 analyses of the future of Kosovo. Referred to by Reuters as the place you can learn more. And on top of Transitions Online, TOL. Now widely featured in Balkan media, posted or mentioned on leading European sites, Reuters, Transitions Online, EUActive, EuropeanVoice, etc. It circulates European embassies and international organisations. The pdf edition is free but please make an honour payment here when you download and print it out. Many links to evidence of the crisis, to Kosovo as failed peace and to the lobbyists who believe that Kosovo should become indpendent now. The international community's political and media reaction is an evasive, subdued understatement of the embarrassing catastrophe. The Kosovo Reality Show needs a reality check now. (Also in Danish and Swedish). There is a long-term background and some root causes behind the emerging peace-keeping failure in Kosovo. They do not fit the standardised image of the conflict. TFF's director who has been engaged in Kosovo since 1991 discusses some of the most important among those causes. In passing, he also points out how an allegedly "prestigious" NGO such as the International Crisis Group serves as a biased NEGO, a NEar-Governmental Organisation, and continues to offer perspectives and proposals that will make things worse in the Balkans. (Also in Danish and Swedish). Read the Military Kosovo Agreement ! Read the Civilian Kosovo Agreement !